I've decided to participate, who wants to join us? The idea behind this is that you post 1 lipstick everyday on your blog. It's preferred that the picture you use is one of the lipstick on your lips, but no one is going to force you to do so. Don't have time to do this everyday? Take multiple pictures in one day and schedule them. I'll be posting this daily in addition to my normal posts, so rather than 1 post a day from me, you'll either get two separate posts from me, or a joint post between the two. 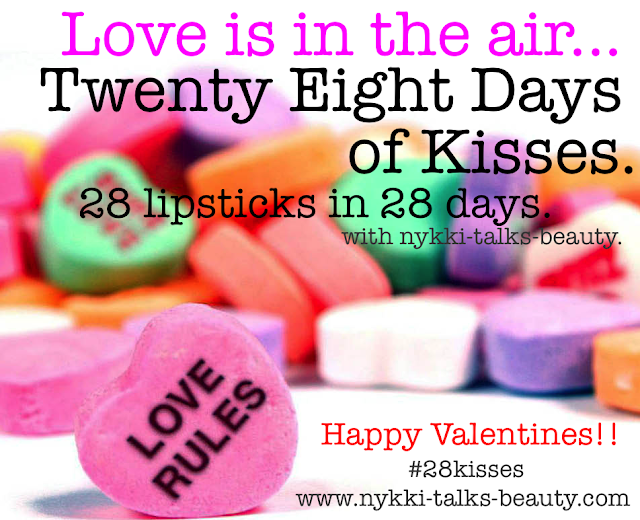 I hope you join us, and if you do, please let me know, and go to http://www.nykki-talks-beauty.com/2013/01/28-kisses-invite.html and leave a comment with your blog link! I finished my half sleeve a few weeks ago, but between being sick, stressed and healing time, I just hadn't got a chance to post it yet. So, that's what I'm doing now. And, in case you missed my last tattoo post, in addition to these, I also have a lily on my back, and a diamond on my ankle. 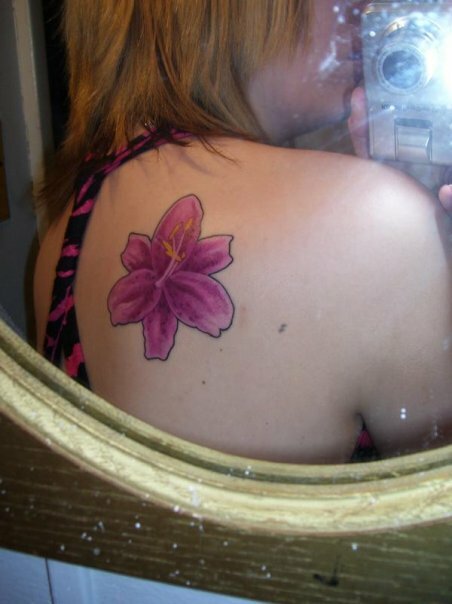 The lily was my very first tattoo, when I was 20 years old. The diamond I got on a Friday the 13th, it was $13, and it's a nice memory to have. I have a lot more tattoos planned, and it's very exciting. Unfortunately, I've got no money to continue with it right now. I also intend to get my nose re-pierced, as I had it done for 5 years, and I had to take it out for a job, and it healed up in 4 hours. In case you didn't know, I also have my ears pierced 2x each, my navel pierced, and a Medusa, which is the piercing in the middle of my upper lip. I don't find that tattoos are very painful, and I have a fear of needles. My sleeve took around 3 weeks to heal, but I feel it takes a bit longer to completely 100% heal. I wash mine in anti bacterial soap 2x per day, and keep it moist with Tattoo Goo for the first week. After the first week, I switch from Tattoo Goo to unscented lotion for the rest of the healing process. Never scratch or pick at your tattoo! Do not even touch it unless you're cleaning it or applying tattoo goo or lotion. No, those aren't cosmetics. ;) Those are my chins & their babies that are 10 days old! How cute are they? They had two babies, both have survived so far. The white chinchilla is the daddy, Odin. The gray is the female, Luna. Okay, now here is the haul. My Little Pony, this is a lavender color, but it's has a green-ish duo chrome, that also has aqua and pink shimmer. In some light it almost looks rose gold. It's beautiful. Dark Crystal. This is also a duo chrome. It's a black with a lilac shift. It also appears red, or blue in certain lighting. It has pink glitter. Fantasia is a duo chrome blush. It's a beautiful bright orange that will be absolutely perfect for summer, and it has a violet duo chrome that looks absolutely amazing. Positively Peachy is a nice peach shade with golden and pink glitter throughout. How pretty are those?! Those are all swatched lightly without a base or primer underneath. I also purchased the mixing medium, which can be used to foil the eyeshadow or to use them as eyeliner. I bought all of this for $21! The Dark Crystal shadow is full size which is 3/4 tsp and retails for $5.90. My Litte Pony and Positively Peachy shadows are smaller, at 1/4 tsp and retail for $2.50. The mixing medium retails for $6.25. All of these are extremely pigmented and high quality. I'm seriously surprised at the quality of these. I also have a duo chrome lip gloss on the way to me that I won in the same giveaway, so I'll post swatches of that when I receive it. I totally recommend this website and this makeup. The products are extremely inexpensive, and completely worth the price. I got the F40 Large Angled contour brush when I purchased the F80 Flat Kabuki. I also love this brush. I hesitated when purchasing this brush as well, because I have a couple of other face brushes that I've always used for my blush and bronzer, and they had always worked fine for me. But, I went ahead and bought this one after seeing many recommendations, and again, I'm glad that I did. This applies my bronzer much better than my other brushes. It doesn't make any harsh lines, and it blends it out seamlessly. This brush is also extremely soft, and it feels great on your face. I also use this for my blush, and it works great for that as well. It's great at applying and blending all of your cheek products with little effort needed. I purchased this brush from SigmaBeauty.com for $16. If you spend $30+ you'll receive a free gift. Use code JAN2013 to get 10% off your purchase. If you have this brush, let me know what you think! Now I really want the E35, F25 and P86, unfortunately, I'm broke for quite a while now. So I got my January Beauty Army box, and I wanted to show you what I got this month. Not Your Mothers She's a Tease volumizing hair spray. This is a nice sample size, and I'm excited to try it out. NuMe Hydro Punch Shampoo. I've tried the conditioner before, and loved it, so I'm hoping to love this as much. Macadamia Deep Repair Masque. My hair is pretty damaged, so I can't wait to try this out. Skinn Cosmetics Twin Set lip gloss & lip stick duo in the shade Pink Tulip. This looks similar to Nyx Tea Rose lipstick, so I'm excited to use it. Whip Hand Cosmetics Loose Pigment Eyeshadow in Special Forces. This looks like a nice color. I'll post swatches and review it soon. And, since this month was Beauty Army's birthday, we got a 7th item. I received the MARK mascara, so I'll let you know what I think of it. I'm extremely picky about mascaras, and the wand doesn't look to promising, but I'll let you know. In case you didn't know, Beauty Army is a monthly subscription service. You pay $12/month, and you CHOOSE 6 items. They have a mix of samples, deluxe samples and full size items. It's a great subscription service. I won a 3 month subscription in a giveaway a couple of months ago, and sadly next month is my last month. I'd love to continue, but I'm not sure I'll have the money, even though it's only $12. If you're interested in this service, go to Beautyarmy.com to sign up! It's really great. Let me know any of these products you'd like to see a review for. I'll be posting a review for the Sigma F40 brush tomorrow, and the next day I believe I will be posting my Darling Cosmetics haul and swatches. I'm not sure what I'll post Saturday, but I'm going to try to get a FOTD up either Saturday or Sunday, and then I'm going to show my brush storage soon. My makeup storage is still a work in progress. I got the Sigma F80 not too long ago, from Sigmabeauty.com and it's become my new best friend. Haha. But, really, this brush has significantly changed the way I apply my makeup. I've always been the kind of person that uses their hands to apply foundation. Every brush or sponge I had used prior to this one had not worked out for me, and I had assumed that all brushes were the same, and way over hyped. I hesistated for the longest time over buying this brush. No, it's not that expensive, if you like it. But, to take a chance on something that I had in my head that I would hate? $18 is a bit steep for that. I almost gave up completely on foundation brushes, but I caved and bought this one. I'm so glad that I did. This was my very first Sigma purchase. I bought this brush and the F40 blush brush, which I'll review separately at a later time. Using my fingers has always worked for my foundation. But, I tried this brush, and I haven't used my hands since. I get the most even, blended, flawless application imagineable. It really looks like my makeup was airbrushed, and I've never had results like that using my hands. It uses about half of the amount of foundation, and it takes about half the time. It covers much better, and you can't even tell I'm wearing foundation. It's honestly amazing. This brush is the Flat Kabuki, it's synthetic, it's extremely dense and very, very soft. It feels like velvet on your skin. It's great for foundation, obviously. I also use it to make sure my concealer is blended in, and it works great for that. I also haven't had any issues, so far, with this brush shedding. It does take quite a long time to dry after you wash it, but that's because it's so dense. I have nothing negative to say about this brush. It's absolutely amazing, worth every penny, and I 100% recommend it to you. Here is a direct link to the brush. If you spend $30, you get a free gift as well! Also, use code JAN2013 by the end of this month for 10% off of your purchase. This is the super lustrous lip gloss in Lilac Pastelle. This is a true lilac shade, and it's awesome. It retails for around $7. This stays on for around 2-3 hours, which isn't bad for a gloss. It's also pretty nicely pigmented, and these aren't sticky, which is really nice. I'm very happy with this shade. If you're looking for a lilac or lavender gloss, this is a great one! Also, I've talked about this kind of lip gloss before, in a different shade. It's my Nars Turkish Delight dupe post. Revlon Just Bitten Kissable Balm Stain. This is the shade Darling, and I love this as well. It retails for around $7 also. This is another lavender/lilac shade, but it's really a light pink with a purple-ish tint. This is very sheer, but buildable. These are very smooth and easy to apply, and the balm lasts around 6 hours on me, which is wonderful. It leaves behind a pink stain, but more pink than you would suspect. I've very happy with this. It isn't sticky or drying at all, feels just like a very moisturizing chap stick. I'm looking forward to getting more of these. Overall, I'd recommend both of these products. I have no complaints about either of them. They're both great products. The top swatch is the Super Lustrous Lip Gloss, and the bottom is the Just Bitten Kissable Balm Stain. As you can tell, I'm pretty obsessed with purple-ish lip colors. Whether it's a deeper or a pastel, I'm going to love it!